UltraTrol is currently offered only in the LN formulation (see below), reflecting the concentration of user demand over time into this version. Inquiries regarding other versions of UltraTrol should be addressed to info@targetdiscovery.com. 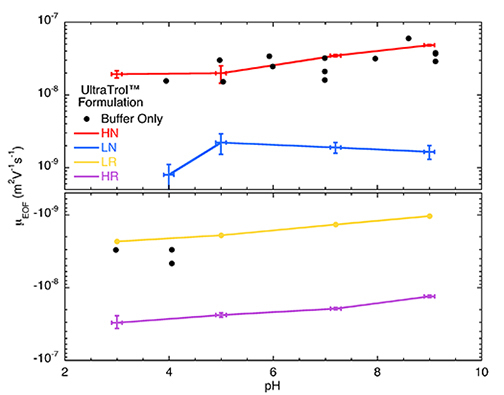 UltraTrol was developed in several formulations that allow the user to select an appropriate UltraTrol dynamic pre-coating to optimize their separation outcomes, within the pH and buffer requirements stipulated by the run buffer. In addition to being relatively independent of pH and buffer selection, a critical value delivered by UltraTrol is the outstanding reproducibility of separation control that it provides for the selected running conditions (note the +/- standard deviation error bars for lot-to-lot variation in the graph below). formulations as a function of pH. Control measurements of EOF for the buffers alone in a bare silica capillary are shown as black solid circles (note reversal of EOF at low pH when UltraTrol is not present). The complete UltraTrol Product Technical Guide containing detailed information to assist in product selection and in planning optimized separations utilizing UltraTrol, is available for your convenience in a downloadable PDF format. When you are ready to put UltraTrol to work in the laboratory, or you are ready to begin designing an SOP for the use of UltraTrol, a succinct UltraTrol Dynamic Pre-Coating User Manual is available for your convenience in a downloadable PDF format. One copy of the UltraTrol SDS is provided with every shipment of UltraTrol. For your convenience, the UltraTrol SDS may also be downloaded in PDF format.